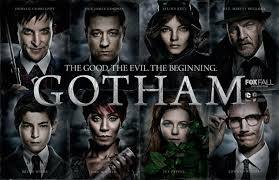 Like any serious professional middle aged man, I’m a big fan of Batman, but I was skeptical about Fox’s new show Gotham. A Batman show without Batman, set in a crime riddled, corrupt city. It sounds like New York City in the 1970’s. In fact, the show sounds like Serpico, minus the villain origin stories. Anyone expecting superhero antics might be disappointed, at least based on the pilot episode that I watched. However, knowing all of that going in, I was not disappointed. Anyone familiar with Batman can guess the broad outlines of the pilot. New Detective James Gordon finds himself investigating the murders of noted city philanthropists and multimillionaires Thomas and Martha Wayne. The crime, an armed robbery gone wrong (or was it?) leaves behind an orphaned Bruce who witnesses the murder of his parents. Hmm, that can’t affect the mental health and psyche of a small child can it? Future history says yes, but this show isn’t concerned about the future. Set in the ever present now, it’s dealing with the gritty life in the big city; Law & Order: Gotham. The Wayne murder case seems to wrap up fairly easily; yep you guessed it, too easy. There is clearly more going on than a simple street crime, and the show not only sets up the murder as the gateway to an even larger mystery, but lays out several different plot paths to be explored, such as the relationship between Gordon’s fiancée Barbara and Detective Montoya. Of course again, like any serious professional person, I have a pretty good guess what the secret is that Barbara and Montoya are keeping, but no point in dropping spoilers. So not Batman, but James Gordon, played by earnest looking Ben McKenzie, makes for a pretty good heroic cop. With a crooked partner in tow, we’ll see what sort of price Gordon may have to pay for being the lone honest cop. Maybe I ought to re-watch Serpico. This entry was posted in Pop Culture, TV & Movie Reviews and tagged Batman, Ben McKenzie, Gotham, Rene Montoya, Serpico, TV Review. Bookmark the permalink. Saint’s preserve us, but Gordon’s partner is Irish! Faith and Begorrah! I wondered how long they are going to keep Bruce as a child. If this series goes for 4 or 5 seasons there could be a slow progression. I don’t think it’s a problem if Bruce grows into a sullen teenager. Batman would still be a ways off and that is new material to work with. I don’t know much about Batman outside of the movies I saw a long time ago. I have a friend that is into comic books and superheroes so I just check with him on things. I wasn’t sure if there were young Bruce stories out there they had to “be true to”. After seeing some of the other new shows, I think I would definitely want to review this one. I finally saw this Friday night. A co-worker recommended I check it out. He knows I’m not a big comic fan, so he wouldn’t have suggested it if this was your typical superhero fare. Long story short, I enjoyed it and will be back for episode 2. Is it just me, or does the lead in this show bear a resemblance to Russell Crowe in L.A. Confidential? Unlike the other superhero shows and movies, this one doesn’t actually have a superhero in it. It seems like a crime drama that uses the backdrop of a superhero show, but otherwise, there doesn’t seem to be anything violating the laws of physics going on. So I could see you enjoying this on that basis.